Our wedding band cover a variety of different venues around Warwickshire which includes providing wedding entertainment at the relatively new and ever increasingly popular Mythe Barn. Mythe Barn is the perfect venue for anyone in Warwickshire or Leicestershire. Set in the heart of the countryside, it offers a pleasant and relaxing environment inside and views of rivers and wildlife outside. Why choose Myth Barn for your wedding? 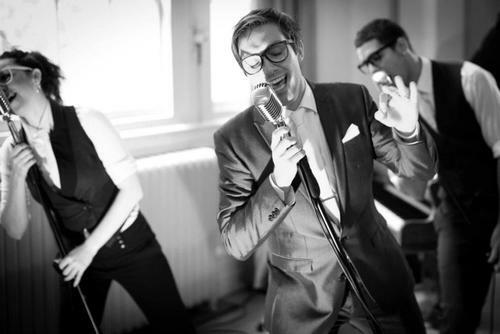 Adam Thomas and The Souljers are a great choice for anyone looking for a wedding band for Mythe Barn, but what's so special about this venue? A recent wedding fair at Mythe Barn attracted more than 300 brides-to-be. This could well be down to its contemporary look combined with rustic charm. It's in a very convenient location for guests travelling from around the Midlands, with all major motorways nearby. Mythe Barn is purpose-built for weddings and includes a variety of buildings such as the farmhouse, which has four bedrooms. The honeymoon suite is located on the first floor of the barn itself and has stunning views of the countryside from the balcony. If you are looking for wedding entertainment for this countryside venue, Adam Thomas and The Souljers will be able to make your night one to remember. Our popular entertainment packages are well suited to Mythe Barn. We offer a variety of different music styles, including soul, swing, motown and classic rock 'n' roll. With two live sets and a disco in between, your guests will have plenty to shout about.